Mike Ford is promoted to replace the oft-injured first baseman on the roster. Mike Ford faced a crowd of reporters at his locker stall inside the home clubhouse Tuesday afternoon at Yankee Stadium. 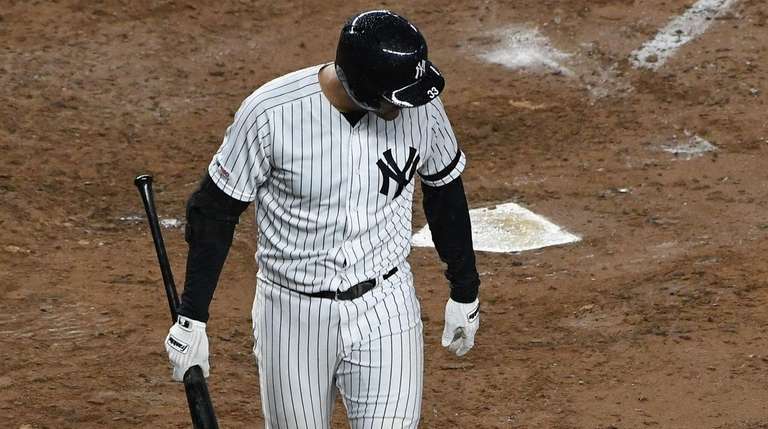 The boyhood Yankees fan from New Jersey finally was living out his dream, making the majors after being summoned from Triple-A because of yet another injury, this time to Greg Bird. It’s called the IL now, but he was on point with the current count. Ford was called up from Scranton/Wilkes-Barre after a fellow 26-year-old first baseman got hurt — again. Bird has a plantar fascia tear in his left foot. He went on the 10-day injured list retroactive to Sunday. So five guys who started on Opening Day — Giancarlo Stanton, Miguel Andujar, Gary Sanchez, Troy Tulowitzki and Bird — are on the IL. A total of 13 Yankees made the list before the season turned 16 games old Tuesday night against Boston. Aaron Boone said Bird was a little sore Saturday when he went 0-for-4, couldn’t do much Sunday and was sent to be tested Monday. He’ll be in a boot for 10 days to two weeks before being re-evaluated. Bird wasn’t at his locker stall during the pregame media availability. Boone said Bird previously had plantar fascia issues. After being called up in August of 2015 and cracking 11 homers, Bird has had injury issues every year. His career average is .211 after 186 games. He had a strong spring, then started 10 games at first to five for Luke Voit. But Bird was batting .171, going 6-for-35 with a solo homer— his lone RBI. The 6-foot, 225-pound lefthanded hitter grew up in Belle Mead and came to Yankees games at the old and new Stadium. Ford became the Ivy League player and pitcher of the year in 2013 at Princeton. The Yankees then signed him as a non-drafted free agent. Seattle took him in the Rule 5 draft in December of 2017, but it returned him the following March. He was slashing .410/.467/.897 with five homers and 14 RBIs over 10 games to start this seventh minor-league season. Now he is a Yankee— at last.